Paw Print Genetics - Puppy Guarantees: Worth the Paper They’re Written On? When you’re looking for a new puppy, buy from a breeder that offers a written health guarantee. The guarantee should cover the many aspects of canine health and the recourse taken by both parties in the event of a sick puppy. But how do you know the guarantee is worth the paper it’s written on? Always get a guarantee in writing. A verbal agreement won’t do any good should you need it. The guarantee should stipulate what exactly is covered: are all physical and genetic disorders covered or only specific ones (i.e., hips, eyes and heart)? The guarantee should stipulate for how long the dog is covered: two years is the standard length, but they vary by breeder and sometimes upon the condition. This gives the dog time to mature, and its bones, eyes and other organs to form completely. Additionally, many late on-set diseases manifest by this time. The guarantee should stipulate what happens in the event of a sick puppy: does the breeder return all or part of your money? Do you receive another puppy? Do you get to keep the affected puppy or do you have to return it? After nearly two years together, don’t underestimate the bond and attachment, regardless of future medical requirements, that you might have formed with a puppy that is suddenly stricken with an ailment. 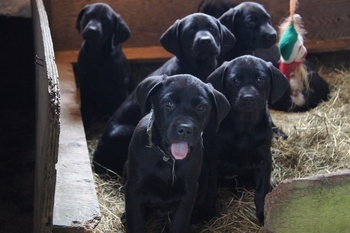 Are you and, perhaps more importantly, your family prepared to give it back to the breeder? That’s something only you can answer – and potentially negotiate prior to buying the dog. Pay attention to the qualifiers: many breeders will have stipulations in their contract, such as mandatory veterinarian visits within a specific period of time, evidence of health testing, shot records, etc. Make sure you’ve adhered to the stipulations or else the guarantee could be contractually null and void. Is the breeder actually guaranteeing a healthy dog or are they just rolling the dice? Conscientious breeders have done their health-care homework. They’ve tested both the sire and dam for breed-specific issues such as hip dysplasia and have a Canine Genetic Health Certificate that shows the dogs’ status when it comes to known genetic mutations. They’re knowledgeably breeding dogs with an eye to bettering the breed and producing healthy puppies. Anomalies can always happen that result in health issues: spontaneous mutations, illnesses that can be caused by mutations on multiple genes or physical trauma that can change the bone structure of a developing puppy. But what a conscientious breeder brings to the table, and is giving you a written guarantee of, is that they’ve done everything in their power to eliminate those anomalies. Breeders that don’t have their dogs’ hips, eyes, heart and other breed-specific points checked, or who don’t perform genetic screening on both the sire and the dam, but still offer a health guarantee (or worse: don’t offer one), are, in effect, ‘rolling the dice’ that they won’t produce a sick dog. They are ignorantly producing puppies with no eye to healthy animals or bettering the breed. They’re likely in it for one reason: money. All they likely want is to line their own pockets with your money. Why would you give an unscrupulous breeder the same amount of money for a puppy that has no health testing when there are meticulous breeders out there who are doing their background work to ensure healthy dogs? That painstaking attention to detail and testing is what contributes to the upfront costs of buying a healthy puppy. You should reward hardworking breeders who take care to produce dogs as healthy as possible with your business, and in return, you’ll receive a written guarantee that’s actually worth the paper it’s written on. Always buy from a breeder who believes in the breed standard. Does the pedigree have lots of Champions? Why is this important? Because the puppy will most likely grow up to behave like dogs who have passed tests to be like that type of dog. The puppy is most like to behave like, look like and be healthy. The price will be the same unless you are looking for a competition puppy.